HOUSTON -- James Harden scored 36 points, and the Houston Rockets bounced back from consecutive losses with a 102-83 win over the Charlotte Hornets on Wednesday night. A big run to start the third quarter put the Rockets well ahead, and Harden put it away when he scored eight straight points to push the advantage to 99-79 with 2 1/2 minutes remaining and send the starters to the bench. The loss extends Charlotte's skid to four games. 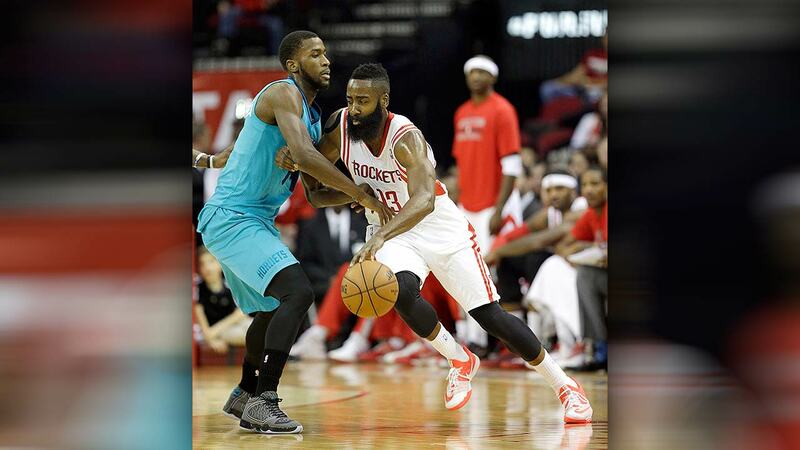 The Hornets played without leading scorer Al Jefferson, who is out with a left groin strain. Charlotte has dropped eight straight against Houston. Michael Kidd-Gilchrist and Gerald Henderson scored 16 points apiece for the Hornets. It was the NBA-leading 14th 30-point game this season for Harden, who leads the league in scoring. He made eight 3-pointers and also had six assists and seven rebounds. Patrick Beverley added 14 points for Houston, and Dwight Howard had 11 points and eight rebounds. A 9-2 run by Houston extended its lead to 85-72 midway through the fourth quarter. With Harden and Howard on the bench getting a rest, Donatas Motiejunas scored four points in that stretch and Josh Smith capped the run with a 3-pointer. Marvin Williams hit a 3 for Charlotte with less than a minute to go in the third, but Harden answered with a 3-pointer to make it 76-68 entering the fourth quarter. Houston had a slim 47-45 lead at the break, but opened the second half with a 13-4 run. Beverley had the first eight points of the run, including a pair of 3s. Howard collected his fourth foul on a charge late in the third and went to the bench for the rest of the quarter and the first minutes of the fourth. Joey Dorsey replaced him and drew his fourth foul early in the fourth on a charge where he knocked Williams to the ground. Williams hit his head hard on the court and left the game with what appeared to be a cut on the right side of the back of his head. He was attended to on the bench for a couple of minutes before being escorted to the locker room holding some gauze on the injured area.